As the largest supplier of lead-based goods in the U.S., we have always invested heavily in our equipment and machinery in order to ensure we can offer our customers the best, most diverse selection of lead solutions anywhere. In 2009, one of the largest lead alloy rolling mills in North America was custom-built and installed in Mayco’s Birmingham, Alabama location. Mayco invested in this piece of equipment to meet its own internal fabrication needs, as well as the growing demand from the industrial market. We have the nation’s largest capacity for producing sheet lead. With this cutting-edge, highly advanced machinery, we are able to create lead plates in the volume you need and produce them to your specifications. This ensures that the plates you receive are perfectly suited for your project. Mayco’s sheet lead is ideal for building, industrial, waterproofing, and various shielding requirements, including X-ray and nuclear radiation shielding. Our lead-lined gypsum board and lead-lined plywood products, as well as our roofing, ballast, and specialty products, utilize our rolled sheet lead. Suitable for any sector, lead plates are versatile building materials that offer effective shielding anywhere. Our in-house refining helps us supply alloys to a wide range of specifications. Mayco has the product knowledge and the manufacturing capabilities to match your needs with the right thickness and composition of sheet lead for your product or project. 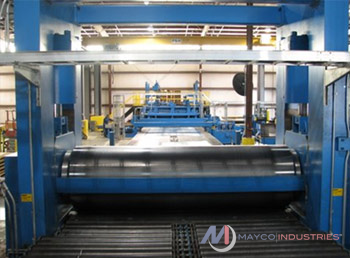 Mayco can fabricate a solid rolled plate up to 10,000 lb. Click here to see our standard sizes and weights. To find out more, or to contact us about your needs, call us at (800) 749-6061.